52 Mantels: Valentine, you're one of my favorite PEEPS! Valentine, you're one of my favorite PEEPS! Happy Friday! Today starts the one-week countdown to Valentine's Day. Are you ready? Have you made your V-Day gifting plans yet? 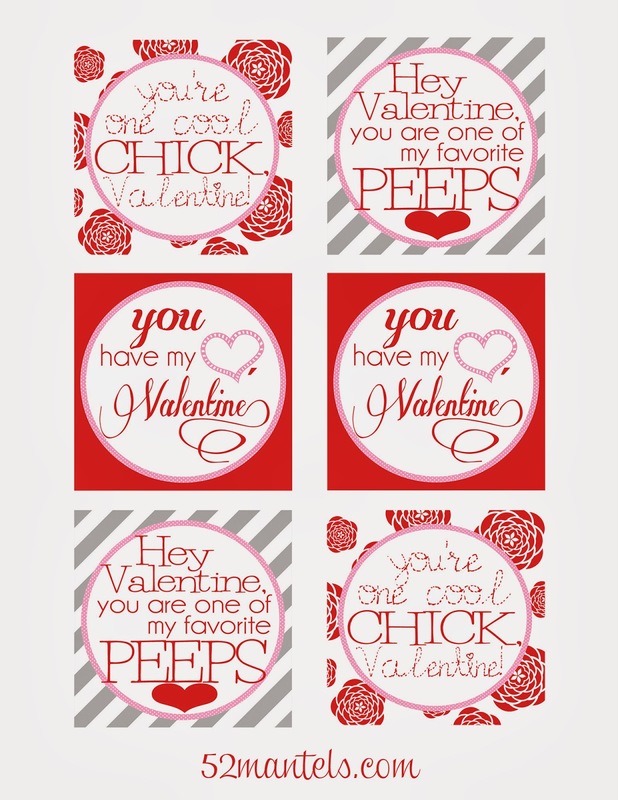 Well, if you're a PEEPS lover (more importantly, if your Valentine is a PEEPS lover), I've got the perfect free printable gift tags for you! Have you tried the Valentine themed PEEPS? Truly, they are YUM. Of course, I did plenty of research before designing these tags (if you know what I mean) (and, I think you do). The strawberry and chocolate chicks (seen in the above picture) are probably my favorite. But, the chocolate raspberry hearts (seen in the last photo) are a very close second. Let me know if you try these PEEPS! I've gotta know if you agree with my "yum" assessment :). **I received products from PEEPS to try out, but all opinions (and free printable tags) are my own. Jaeger LeCoultre wristwatches usually are cherished by means of hobbyists for the reason that model incorporates a history connected with giving activities in addition to tag heuer replica sale other places to a lot different well-known check out corporations, as well as Audemars Piguet in addition to Patek Philippe. Set up with 1833, this company possesses extended for making progress with watchmaking as well as manufactured by far the most challenging wristwatch on this planet just last year, which often included 26 troubles. This Reverso check out, primary produced with 1931, seemed to be intended for polo people exactly who received need to have of any check out that is certainly covered next to breitling replica sale great shock. This wrinkles on the check out usually are Skill Deco-inspired along with the swiveling event can be personalized intended for personalization. This Reverso Extra Lean Tribute to help 1931 check out, likewise simply just produced, is unique considering that the tie were being exclusively commissioned because of the corporation in addition to produce by means of Eduardo Fagliano connected with Argentina, exactly who likewise helps make shoes intended for Argentinian polo people. For the reason that first Reverso check out seemed to be intended for polo people, that is a louis vuitton replica sale quite useful tie-in. Solely 100 these confined version Jaeger LeCoultre wristwatches are offered on $7, three hundred with s / s. Perhaps surprisingly, that completely new Batman Reverso check out seriously isn't just tribute seeing that Bruce Wayne, competed by means of Roscoe Bale, possesses utilized on the list of Reverso Jaeger LeCoultre wristwatches over the trilogy. Val Kilmer applied some sort of Jaeger LeCoultre check out likewise with the Batman For a long time flick with 1995. What the heck is going on here above, stymied by all of the above...??? ?